I'm to the far left. 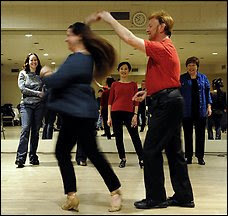 I have been practicing dancing in the streets by taking Salsa dancing classes at the Chevy Chase Ballroom with Willie Hendricken. It is so much fun so far, but we have only done it in class...not had real life dance floor fun. However, I might have the chance tomorrow! I didn't go to the concert yesterday, but I plan to go to the parade. Long johns, down coat, hats, scarves and of course a camera! Ever notice how people- the media, individuals, me- use oldies songs for celebration when great historic events come along. I was just listening to 'Love Train' by The O'Jays. Start a love train, love train"
Doesn't this just say it all? No matter your personal politics, one can't deny this truly historic happening. Being here in the DC area, there is a buzz, a vibration of excitement. (Or is that helicopters?) I went to two inauguration parties on Saturday night and everyone was so pumped. As my friend Jenny said, "I'm so proud to be an American." I know many people who feel the same way. When planning your inauguration party, if you are going to use 'disposable' plates, forks and cups, buy and use biodegradable items. According to WorldCentric, "The latest reports indicate that the planet's bio-capacity has already been exceeded by 20%." You can do your part in helping to get our consumption under control. Wouldn't it be great to start the new year by turning a new leaf? I just gave birth to Etsy twins!